Jean Claude Van Damme the muscles From Brussels he was the man in the 1990’s when it came to action flicks of the decade but now days he seems his choice of film ends up direct to DVD. Equipped with a WWE style mullet, dressed in his regular denim JCVD finds hemself on top of a mountain frozen and very tight. 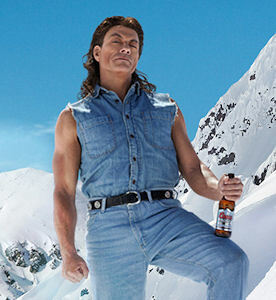 The coldness he feels while on top of the mountain is nothing compared to the cold and refreshing feeling of Coors Light,Jean-Claude Van Damme perform a series of comic monologues detailing times he has attempted to match the refreshment of an ice-cold Coors Light – and failed. The ads have now been playing on British television the past week or two and now the good people at Coors have been in touch with The Peoples Movies telling us about the new advert “My Tear”. Check out the new ad below along with the 2 previous ads which show us the man does possess a funny bone in his body! Watch out for the big sweaty bears as they may steal your clothes!